I was not really close to my mother, not at all. She was quite a difficult person and did not really like people or put herself out for them. But she did love animals. We always had cats which is why I have always floowed suit and had one. My home would seem empty, devoid of loveliness and the mischief factor without one. Mother used to write to governments all over the world to protest about their treatment of animals. She would cry if she saw a story about cruelty in the papers. She would confront people about their animals too. I remember her marching up the village hill to where the local hunt met and publicly scolding the Master of the Hounds for taking part in bloodsports. She also scolded the local butcher. Unfortunately there was a small slaughterhouse in the village. A cow got way and they chased it through the church fields. Can you imagine the poor creature running for its life? Sadly they caught it and took it back to be killed. People protested that they should have granted it its freedom. That haunted us for years. The butchers is still there and whenever I see it, my heart goes out to that poor desperate creature. Mother grew up in the East End of London and she always ran out to see the rag and bone man with his horse. She vowed that she would have her own horse to look after when she grew up. It was a promise to herself that she kept. When I was eight we moved to the Kent countryside and initially we used to take car rides around the local villages to see horses. We found some horses in a field in Collier Street. They were owned by a gentleman from London. We got talking to him and he allowed us to visit whenever we wanted to. The highlight for me was when he let me name one of the young male foals (colt). I called him Prince Caspian as I was into Narnia books then. Prince was the name of his sire, his dad. Prince was a very beautiful horse. He was a rig. A true rig is a male horse that is carrying either one or two testicles hidden in its abdomen. So it looks like a gelding (a neutered male) but it behaves like a stallion. These horses are medically known as a cryptorchid, literally meaning “hidden testicle”. But with people he was the gentlest horse that you could ever imagine. It would have been safe for anyone to approach him. The owner, Bill used to exercise him by making him pull him around in a trap down the Kent roads. Apart from those brief outside excursions, he was left in a stable and it was dark. Our family absolutely adored him so Mother asked if we could buy him. Bill agreed. But we could not keep a rig as they are very excitable so he underwent a complicated operation at a nearby vets. He came through and I remember going to see him. He was in a stable and all I can recall is that as we left he seemed to be crying as a tear was coming from his eye. Just to remind you that I was a young child then. We did notice that a cow was in an adjacent stable. Well, a couple of days later, Dad took a phone call and when he replaced the receiver, he looked really upset. He broke the news to us that Prince had died. The cow next door had a virus and a stable hand neglectfully put some of its straw in Prince’s stable. He had caught the virus and died. The vet was absolutely choked according to Dad. He even broke down crying on the phone as he was informing Dad. The whole family mourned the passing of such a beautiful horse for a while. I, at the time thought that Prince had known that it was the last time that he would see us and that was why he was “crying”. Mother later met someone who knew a dealer who used to bring ponies back from the New Forest to sell. She bought one and her and dad went through a crash course in learning how to look after and tame a young wild colt. But they managed it. His name was Sonny and my Mother used to sing that song “Climb Upon My Knee Sonny Boy” to him whilst brushing his mane. He was not ridden. Mother thought that it was actually cruel to ride a horse. But she did halter train him and my father and her used to take him out for walks which was a bit hazardous as he towered above Dad at one stage and was very excitable. He lived for many years and after he passed, Mother had two more horses, Lucky and Lady. They also had privileged, free and tranquil lives. Mother used to ride a red chopper bike and have a black bucket on one handle bar. The field was about two miles from home and she was a regular sight pedalling along the road singing. Eventually my Mother and Father got too old to have horses. Mother sadly became practically housebound as she suffered from arthritis in both knees. I think that it was like a light had gone out in her life after that. In September last year she fell from the arm of a chair and broke her hip and had a small heart attack. They operated and she went through a long and brave struggle to learn to walk with a zimmer frame. Then she caught a chest infection which turned to pneumonia. She sadly passed away on December 5th 2012. She did not leave a will but she had a request. 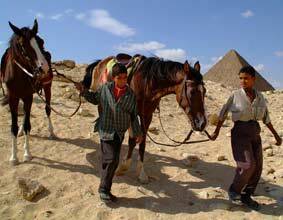 She had some savings and wanted this used to build a donkey and horse shelter in Egypt. We were amazed that she had saved over £20,000. The money has been passed to the Brooke Animal hospital in Egypt.Dad recently received confirmation that the shelter will ether be built in Aswan or Edfu, after they have done some research to find out where it is most needed. When the shelter is built, I will go to Egypt, take pictures and write about it on here. This entry was posted in Ancient Egypt, Animal Work, People, SOW School Of Wyrdynamics and tagged animal welfare, Aswan, Brooke Animal Hospital, Death, Edfu, Egypt, horse, legacy, mother, New Forest, rig, slaughter, stallion. Bookmark the permalink.